New York is a city overrun with lines -- and New Yorkers, while typically impatient creatures, have an impressive threshold for waiting in them. But beyond the spread of standard around-the-block lines at Dominique Ansel and House of Yes, perhaps the most notorious New York City line belongs to Supreme. Tucked off of SoHo’s main drag on Lafayette Street, Supreme’s narrow skatewear shop often gives way to a line that drags around the corner and onto Crosby Street, spanning several city blocks in length. The label, known primarily for its collection of T-shirts and hats emblazoned with a red and white logo, was founded by James Jebbia in 1994 and has developed something of a cult-following over the past two decades -- a statement that is substantiated by the enormity of the line outside the NYC flagship store alone. Throngs of Westchester-native early teens in backwards five-panel hats gather in clumps alongside moodier skateboard-toting New Yorkers, waiting solo with bulky headphones in place. The whole affair resembles something of a hype-beast parade. On a recent Thursday afternoon, I stood by the skate shop’s glass front doors for a number of hours, hoping to learn more about the iconic line from the 10-or-so on-duty bouncers. “Sometimes this feels more intense than most of the clubs I’ve bounced for,” one of four bouncers stationed closest to the storefront told me. He declined to give his name, and was dressed in head-to-toe black, including a knit beanie in blistering mid-August heat. He was also at least a head taller than most of the line’s patrons. “These kids want this stuff way more than most people wanna get inside a club." Apparently, the hype around Supreme apparel cultivates a line-culture all its own -- and while it may seem excessive to employ bouncers for a line largely made up of people who can’t legally drink, anyone who has witnessed it in action will beg to differ. When new Supreme apparel “drops” -- as in, new products are released -- loyal fans will line up full days ahead of time, armed with backpacks and sleeping bags, prepared to claim their spots on the line. Rather than release a full season’s clothing all at once, the label will “drop” a small selection of products each Thursday for several months, reliably drawing the hype out as long as possible. The whole affair makes the seventh Harry Potter book release look like child’s play. 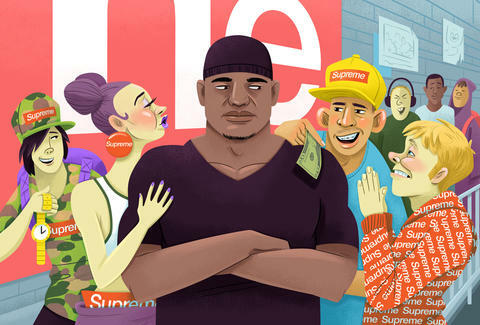 But like most things people are willing to line up for, Supreme has both haters and disciples -- and more often than not, the bouncers air on the hater end. “Where does the line start?” I heard a group of girls, all dressed in various iterations of camouflage, ask the bouncer next to me. “Around the corner on Crosby,” he pointed to his left, barely bothering to make eye contact with the group. The girls pleaded with him for a moment, pouting and widening their eyes. “We have school tomorrow,” one of them whined. “If we don’t get into the store today we can’t come back until next weekend.” He shrugged, and after a few desperate moments of whispered conversation amongst themselves, the girls shuffled around the corner towards the end of the line. “See what I gotta deal with?” he laughed. This was the whole prosaic routine of his job. In the span of time I spent outside the shop, I watched two boys and one girl offer the bouncer rolled up bills, holding their fists out slyly as if they were the first to consider this route for circumnavigating the line. Each time, he would assess the amount and smirk, “20 bucks?? That’s gotta be a joke. That wouldn’t even buy you a sock at Supreme -- back of the line.” I watched one boy edge his way into the front section of the line (much to the dismay of the others), only to quickly scurry off, his Supreme backpack hoisted high on his shoulders, after the bouncer took a single step towards him. Before he’d even reached his assigned post, the front-of-the-line bouncer was already yelling at the cluster of boys up top, most of whom wore floral hoodies in some fashion-forward rendition of Hawaiian print. “Do you know if they still have the bomber jacket in white?” one of them asked, wringing his hands in apparent agony over the stock status of his desired item. “I don’t know -- I been out here with you all day,” the bouncer answered, crossing his arms and turning back to face the store. To keep the hoard of streetwear worshipers from blocking crosswalks and getting in everyone else's way, the line gets broken up into sections. A different bouncer mans the front of each of these sections, offering stamps to the front members as proof that they have, in fact, waited through the line’s full course. “Where’s your stamp?” I heard the front-of-the-line bouncer deadpan several times. There were a handful of excuses -- “I put on hand sanitizer and it came right off!” -- but for the most part, the stampless kids hung their heads and backed out of the line, knowing it had been a futile endeavor. Supreme apparel is intentionally “dropped” so that it remains available solely to the dedicated few willing to wait. Whether or not the articles themselves are worth the trouble, the very act of owning them serves as a badge of exclusivity -- one that, according to these bouncers, can feel even more validating and selective than entrance through the front door at a major New York club. “I don’t know what it is,” the same bouncer explained to me, “but these kids will stop at nothing to get their stuff.” Their bribes may be meek, but their willingness to wait, to scheme, to cut school and sleep on the sidewalk, speaks volumes. Eliza Dumais is a writer who thinks it sounds pretty damn silly. Follow her @elizadumais.